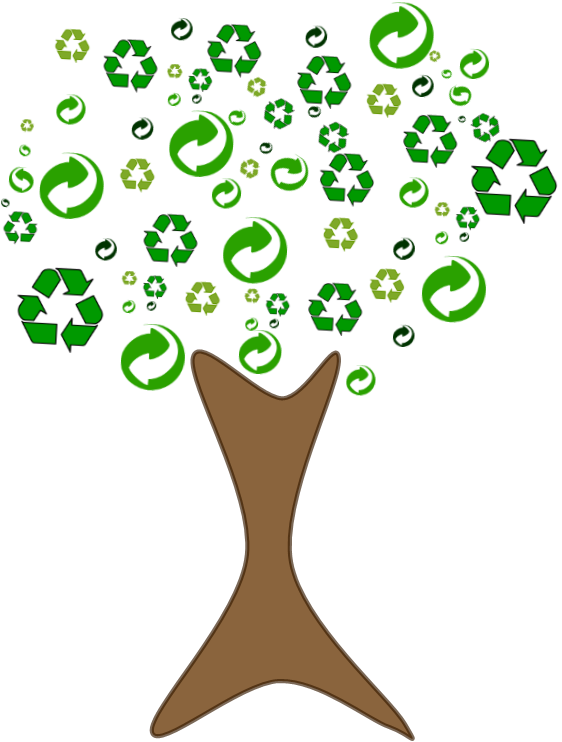 UpTeKK, helping businesses start recycling today! 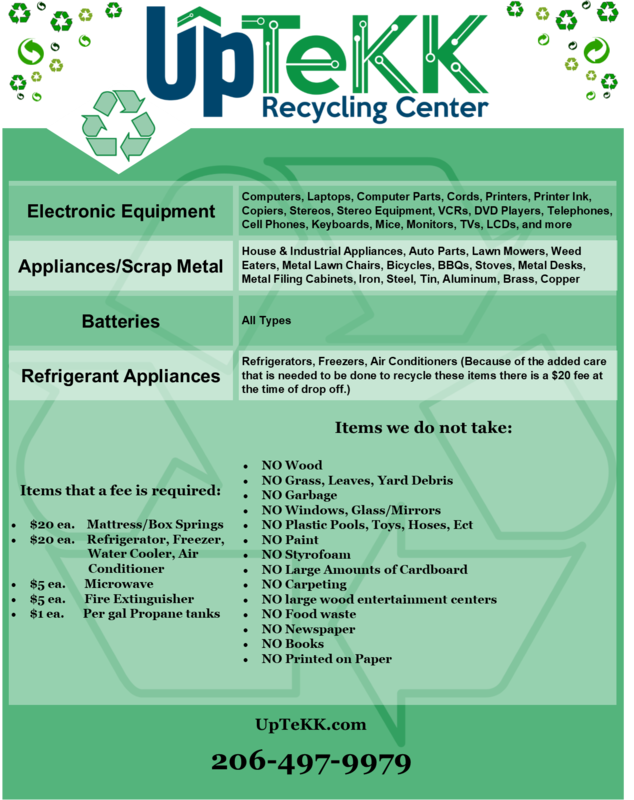 UpTeKK offers free commercial recycling event services for property management companies and their respective properties. 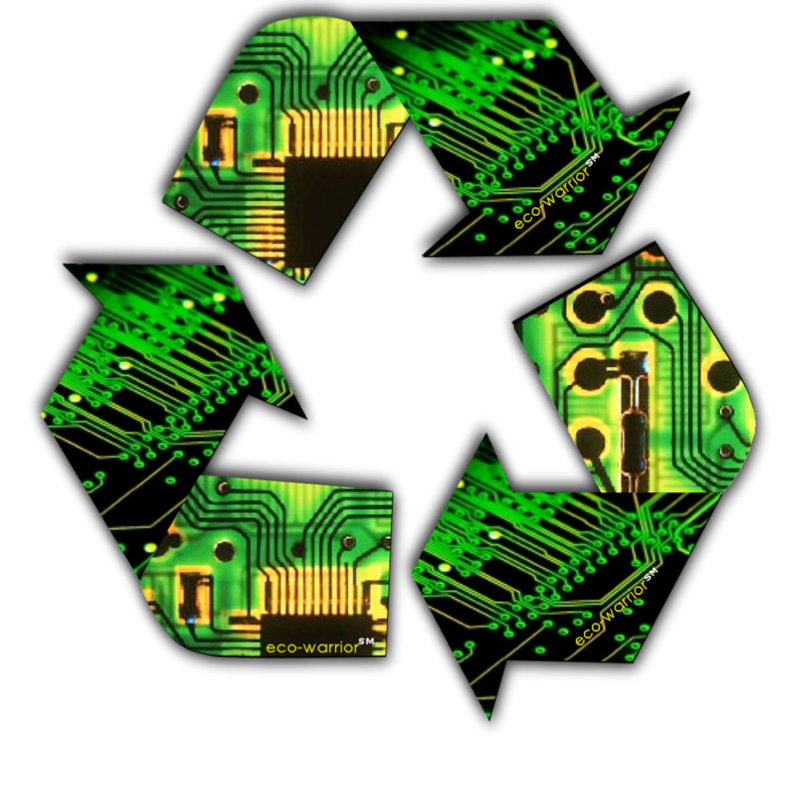 We are able to recycle all electronics, computers, monitors, TV’s, printers, batteries, cardboard, scrap metal and more. We have the staffing and equipment available to go to each tenant in any property you manage and haul away all unwanted items. For a complete list of items we accept, please see our company flyer at the bottom of the page. We wipe all hard drives we receive and are registered with Microsoft as refurbishers. We are licensed and insured and are recognized by the state of Washington as part of the E-Cycle Washington program and we can also be found on the Pierce and King County Websites. We always bring cleaning equipment with us to ensure that no mess is ever left behind by us. We design custom flyers and can email you them as a PDF file for you to email to your tenants and upon request we can print out flyers for your event and bring them to you. We can have a stationary box truck present for tenants to bring items to for a set amount of time (Items from home also welcome). We can have a signup sheet that you could either fill out or have tenants contact our event coordinator to fill out. Then on the day of the event, we would go to every tenant on the list and pickup from each tenant. We work with you to make sure that all of your standards are met and your goals for each event are achieved. We guarantee that you will get positive responses from your tenants. They are always happy to rent from a property management company that goes above and beyond and we are always here to help. 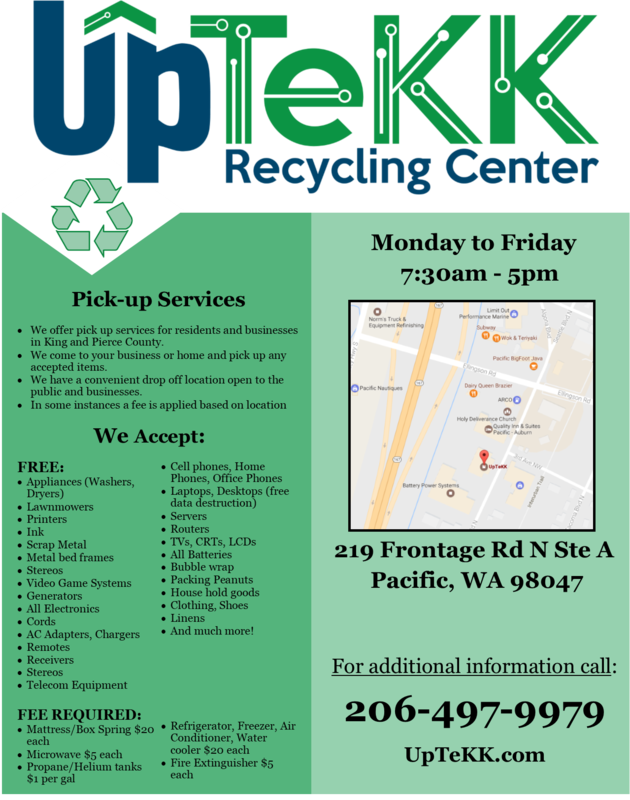 To sign up for your free recycling collection event service through UpTeKK, please contact our Event Coordinator via email or phone and reserve your free recycling collection event date. Please fill out the form below today so we can start helping you and your tenants start recycling today! Please fill out the form today so we can start helping you and your tenants start recycling today!